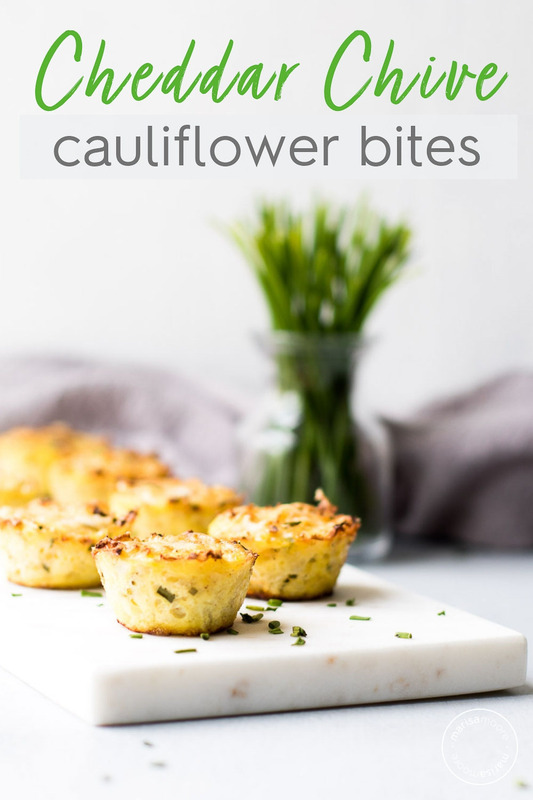 These easy cheddar chive cauliflower bites are the perfect appetizer for your next party! This post is sponsored by my friends at Cabot. Spring has finally sprung and it’s time for lighter, brighter fare. You might be seeing bridal shower, graduation party, and spring brunch invitations trickle in too. But if you’re the host, keep reading. I’m sharing a veggie-forward appetizer recipe to help you get in and out of the kitchen quickly. 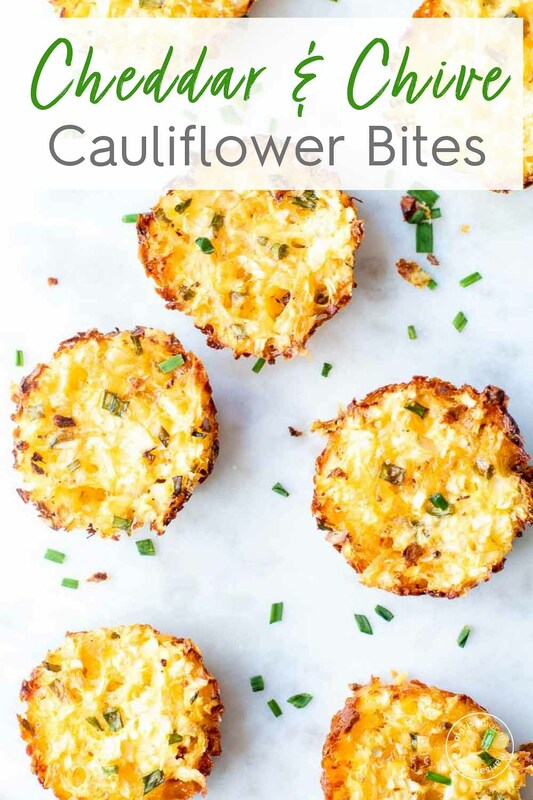 These cheesy cauliflower bites are super satisfying and so easy to make. I’m telling you now. You might want to bake a double batch – so you can enjoy a couple before the party. With only 4 ingredients, these easy cheddar chive cauliflower bites are the perfect addition to your spring brunch or party table. Plus, you can make this vegetarian appetizer ahead of time to make entertaining a breeze. Because the recipe features only a few ingredients, it’s important to choose high-quality ones. 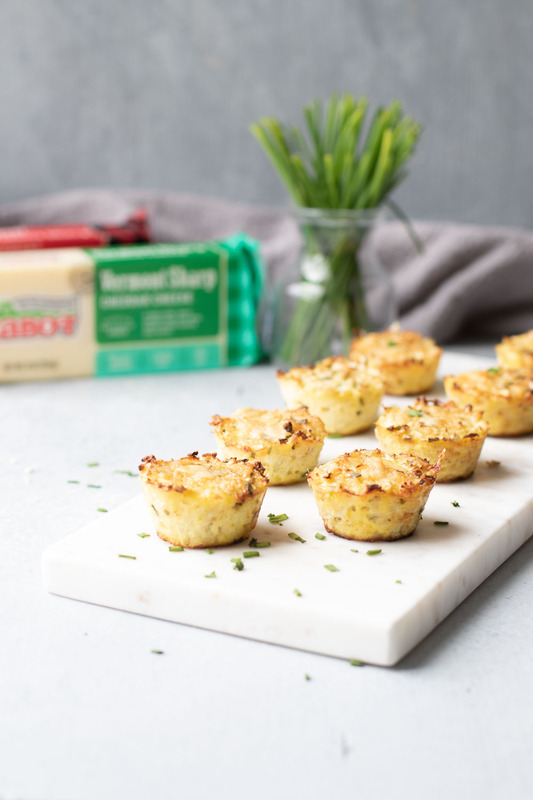 I’m using Cabot Seriously Sharp Cheddar for the most intense flavor, but feel free to explore any of their classic or flavored cheeses in this recipe. The fresh chives add a hint of onion goodness and a pop of vibrant color. And both perfectly complement the cauliflower base. I discovered Cabot on a cheese board at a work event many years ago. Their wide variety of high-quality cheddar cheeses is impressive. 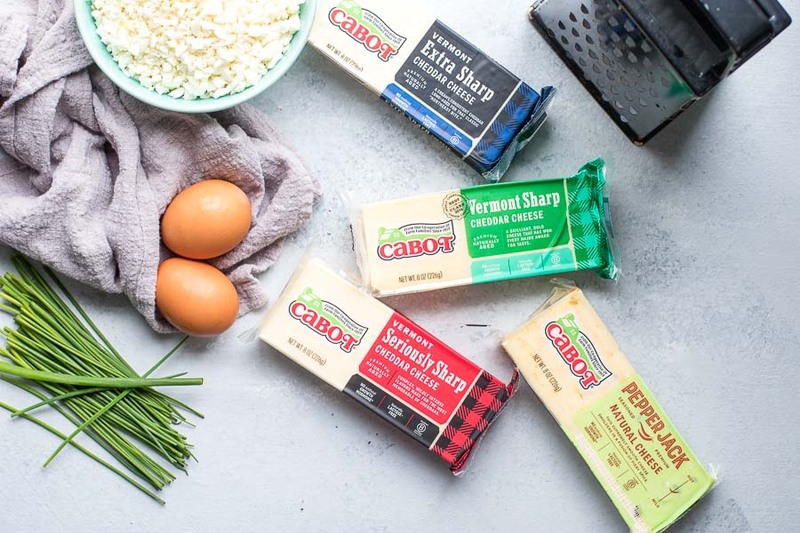 If you are not familiar, Cabot is a co-operative owned by farm families throughout New England & New York and 100% of profits go back to the farmers. All Cabot cheddars are 100% naturally lactose-free too, which your guests will surely appreciate. Use riced cauliflower. I used pre-riced cauliflower to make this recipe a cinch. 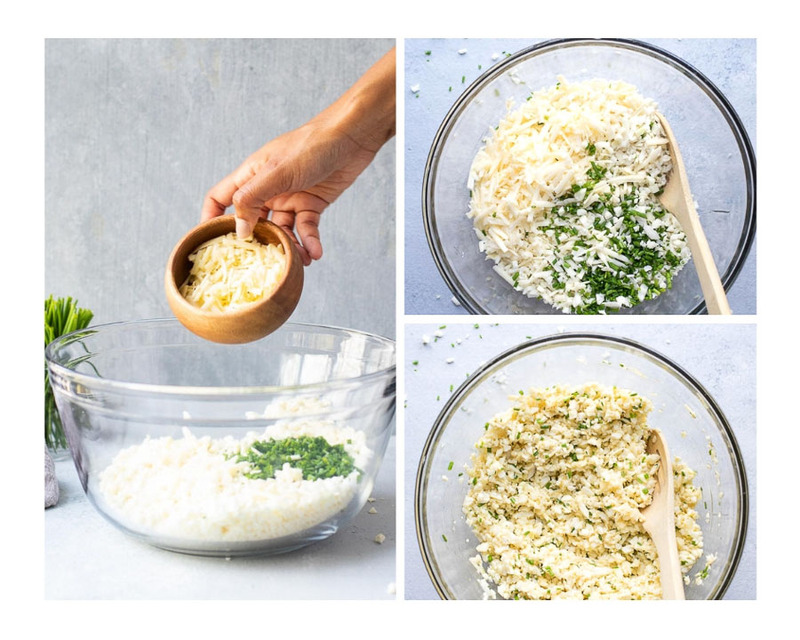 If you rice your own cauliflower, be sure to squeeze out any excess liquid. Start with a medium or large head of cauliflower to yield 5½ -6 cups of cauliflower rice. I do not recommend frozen cauliflower rice for this recipe. It would add too much water. Pick the right muffin pan. Use muffin liners, a non-stick muffin tin sprayed with oil, or a silicone pan to make sure these little bites don’t stick. My first batch stuck like white on rice to my old muffin tin. I mean… I still ate them. But I had to really work to get them out! I used a silicone muffin pan the next time and they didn’t stick. The pan didn’t even need to be oiled. Adjust the cooking time as needed. Speaking of pans. To achieve that golden color, I cooked the cauliflower bites a few minutes longer in the silicone pan compared to my dark, non-stick muffin tin. That’s because dark metal pans tend to cook food quicker and brown foods faster. Keep that in mind when choosing your pan. Tight on time? These cheddar chive cauliflower bites not only come together in a pinch but they can be made ahead of time too. Make ahead. Once cooled, refrigerate the bites in a sealed container for up to 3 days. When you’re ready to serve, place in a single layer on a sheet pan. Pop them into a 350ºF oven for 5 minutes, or until heated through. Freeze and reheat. Store the cooled bites in a single layer in a freezer-safe container for up to 3 months. Reheat in a 400ºF oven for 7-10 minutes, or until heated through. 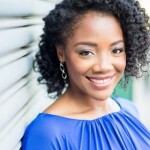 Before you head out, check out my tips for adding a healthy touch to your next brunch. Offer light, bright, and satisfying finger foods like these cheddar chive cauliflower bites. Set out platters of spring vegetables like fresh asparagus, snap peas, and radishes. Sweeten things up with seasonal fruit like strawberries for dessert or slice them into cold, still or sparkling water. Use fresh herbs in small vases or glasses with water to decorate the table. Ready to eat? Here’s the easy recipe. Please let me know when you make it! These easy Cheddar Chive Cauliflower Bites are the perfect party appetizer. This make-ahead vegetarian appetizer recipe is ready in less than 30 minutes for easy entertaining! Beat the eggs with the spices in a large bowl. Add the cauliflower, shredded cheese, and chives. Stir until well combined. Spoon the mixture to the top of the muffin tin wells. Bake 20-25 minutes until the cheese is golden and the bites are cooked through. Let cool in the pan 3-5 minutes. Remove from the pan and transfer to a cooling rack if not serving right away. Serve warm or at room temperature. *Use muffin liners or a non-stick or silicone muffin tin to make sure the bites don’t stick. In my experience, silicone pans don’t need to be oiled. I loved the sight of these bites. They look delicious & what a great idea to make it with sharp cheddar. Thanks for the share! Oh these are so perfect for a springtime brunch! And let me say, anything with cheddar and chives together calls me right in! Adding these to my list! These appetizer bites are sure to be a party hit! They look delicious! Absolutely love this! Always looking for new things to do with cauliflower as it is such a great food and this is a great recipe with it! thanks!